Home > Construction Training Manuals > Utilitiesman Volume 01 > Figure 6-31.Making Angular Alignment. In leveling a pump unit, first use small metal wedges (fig. 6-29) and then place metal blocks and shims close to the foundation bolts. In each case, space the supports directly under the part carrying the most weight and close enough to give uniform support. Leave a gap of about 3/4 to 1 inch between the baseplate and the foundation for grouting with cement. (Grout is a mixture of cement, sand, and water, making up a thin mortar.) Figure 6-30 shows a baseplate of a pump unit grouted to the foundation, making angular alignment. Adjust the supports or wedges until the shafts of the pump and the driver are level. Use a level to check the coupling faces and suction and discharge flanges to ensure that they are plumb and level. Correct the positions by adjusting the supports or wedges as required. In addition to checking for parallel alignments, you should check the angular alignment between the pump shaft and the drive shaft. 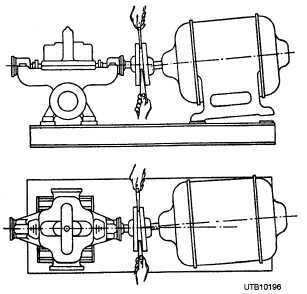 Insert a taper gauge or feeler at four points between the coupling faces, as shown in figure 6-31. The points should be spaced at 90-degree intervals around the coupling. When the measurements are all alike and the coupling faces are the same distance apart at the four points, the unit is in angular alignment. Correct any misalignment by adjusting the wedges or shims under the baseplate. Remember that an adjustment in one direction can disturb adjustments in another direction. Figure 6-29. - Wedging a baseplate. Figure 6-30. - Baseplate of a pump unit grouted to the foundation. Figure 6-31. - Making angular alignment. Many of the pumps used by the Navy are centrifugal pumps. 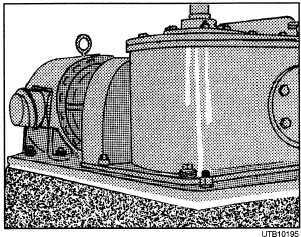 Figure 6-32 shows a typical installation of a centrifugal pump. There are two types of assembly in which centrifugal pumps are delivered. One group has the pump and the driver mounted on a common baseplate at the factory. The other group has only the pump mounted at the factory, so the driver must be positioned at the place of installation. In the former group, factory alignment may not have been maintained, as all baseplates are somewhat flexible. Therefore, you must realign the unit after it has been leveled on the foundation. To do this, first disconnect the coupling halves. Then follow the same alignment steps that have just been given. After completing these steps, reconnect the coupling and check it again for parallel and angular alignment. To install a centrifugal pump of the second group, you have a little extra work. After you have placed the baseplate with the pump on the foundation, you level, align, and bolt it. Next, place the driver on the baseplate according to the blueprints. Adjust the position of the driver and shim it up until the pump and driver half couplings are aligned. Then bolt it securely and proceed as in the other installation. After you have correctly aligned the pump, tighten the foundation bolts evenly, but not too firmly. Then completely fill the baseplate with grout. Try to grout the leveling pieces, the shims, or the wedges in place. Foundation bolts should not be fully tightened until the grout has hardened, usually about 48 hours after pouring.